A bunion is one problem that can develop due to hallux valgus, a foot deformity. The term ?hallux valgus? is Latin and means a turning outward (valgus) of the big toe (hallux). The bone which joins the big toe, the first metatarsal, becomes prominent on the inner border of the foot. 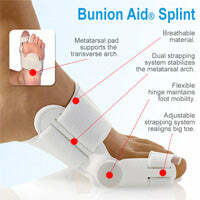 This bump is the bunion and is made up of bone and soft tissue. SymptomsAudible clicking (called ?crepitus?) and/or stiffness in the affected joint which indicates that the joint surfaces are rubbing together improperly. Inflammation, degeneration of the surfaces of the joint, deformity (including bone growth at the joint line and displacement of the toe) and ultimately, loss of range of motion in the joint. Pain at the side and top of the joint that worsens with walking and physical activity.